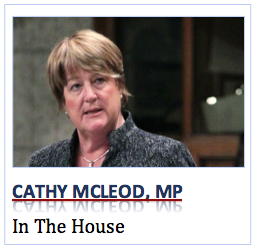 Excerpt from comments by Kamloops-Thompson-Cariboo MP Cathy McLeod during debate in the House on Friday, Sept. 21, 2018 on Private Member’s Bill S-245, “an Act to declare the Trans Mountain Pipeline Project and related works to be for the general advantage of Canada” submitted by Conservative MP Shannon Stubbs of Lakeland, Alberta. McLeod also refers to Bill C-69, the Impact Assessment Act, which would establish a new federal process for environmentally significant projects. It would replace the National Energy Board with a new Canadian Energy Regulator. I KNOW THAT in an ideal world we would not have any dependence on fossil fuels. However, we continue to have that dependence. It is not just the gasoline for our car or the jet fuel for the planes that fly us to Ottawa and back home. Over 6,000 products require the use of oil. In the short and medium term, the world, not just Canada, will continue to rely on oil and its products. I do have a belief that there will be technological advances that will create some solutions. Dave McKay, the president of RBC, said, “Canadians are polarized about oil and gas when we should be focused on how cleanly we can produce it, how safely we can transport it and how wisely we can consume it.” Those are very important words. Alberta is working very hard on how to cleanly produce. The discussion we are having today is how we can safely transport and then it is up to every individual to look at how wisely to consume it. The government has decided to put all its eggs into one basket. The tanker moratorium simply means that people from Lac du Ronge and Eagle Spirit have been cut off, with no consultation on the opportunities they thought might be there for their communities. Of course, that would be a northern route. This bill is currently in the Senate. Again, it cuts off opportunity to get oil to the sea water. Bill C-69 has been called the “never build another pipeline again” bill. I tend to agree. 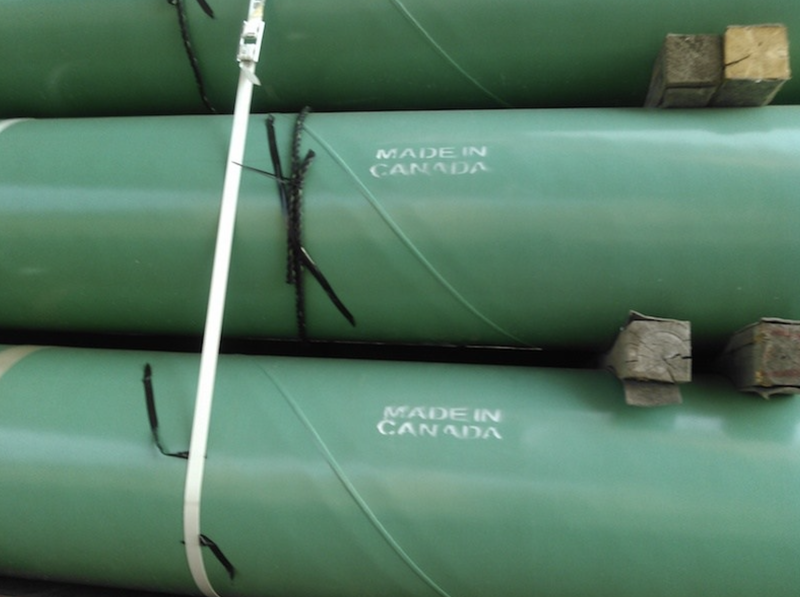 Changes proposed in Bill C-69 mean that another pipeline will never be built in Canada again. That is a huge problem. We can look at what is happening in the States and across the world. We basically have landlocked resources. In the short and medium term, we will be uncompetitive. Having a “no pipeline” bill is important. However, what people do not realize is this. Look at the rail traffic. I live on a rail line. I was at a ceremony this week for a change of command for the Rocky Mountain Rangers. Fifteen metres from us was a rail line, which goes straight through Kamloops. Tanker car after tanker car travel right through town and along the Fraser River. It had already come down the Thompson River while salmon were spawning. When we talk about transportation safety, it is relatively safe. However, it is more safe to transport oil through a pipeline than by tanker cars, which travel right through the middle of town and along the spawning channels. We have had wildfires. We have seen the instability of slopes when rains come. We are having washouts. There is big concern about the enormous increase in the tanker cars that go through our communities. This does not even address the issue that we hear all the time from our grain farmers and mining folks about the bottleneck on the rail lines. As the rail capacity increases for tanker cars to transport oil, we bottleneck our supply system, our supply chain. This is a huge problem. Northern gateway and the TMX is really a tale of two pipelines, because it has been largely decision-making by the current government. Northern gateway went through its process and it was approved by the former government. A court decision came out and it was very clear. The Liberal government received that court decision. It said that some things needed to be done to improve consultation with first nations. The decision was received by the current Liberal government. Every time those members suggest that they inherited a flawed process, it is quite clear that it was not the process but it was the execution of the process with northern gateway. It became much clearer that they did not learn any lessons after reading that report, in spite of the fact that they said they had. The Liberals completely botched their execution with respect to the duty to consult on the Trans Mountain pipeline. The first decision said they could not simply be a note-taker. The Liberals had that information. What did they do? They sent someone to take notes. How is that looking at a decision and implementing it? The minister stood up time after time and said that there was no relationship more important than the government’s relationship with first nations. He said they were engaged, that they have had the best process ever, and yet his government did the exact same thing. Someone was sent to take notes and the government did nothing in terms of dealing with the issues at hand. The Liberals failed. They failed as plaintiffs. Six communities took them to court with respect to the duty to consult. More important, they also failed 43 communities that had benefit agreements and were looking forward to the opportunities that would come with the construction of this pipeline going through their territory. About one-third of the pipeline goes through the riding that I represent, which includes many communities as well as many first nations communities, the majority of which had signed benefit agreements. After the decision came down I met with a number of first nations and other communities. One group had to completely redo its budget. It had counted on the benefits from this agreement. This group had to wonder what it could slice and dice out of its budget because it was faced with brand-new circumstances. I met with another group called Simpcw Resource Group. As construction happened, and in the past, this company had been responsible for returning the disrupted land from the construction of a pipeline back to its natural vegetative state. Companies are planting trees as we speak, planning on the economic opportunities. Construction camps are being planned. Cooks were looking forward to opportunities. These are real people. These are real jobs. The fact that the Liberal government could not look at a court decision that came to them in 2016 and do the job properly is absolutely shameful. It failed to execute. When the government says it had a flawed process given to it, it is absolute nonsense. The government was told what it needed to do in order to do it properly. Please, do not ever let them say they were provided with a flawed process. The court decision was absolutely clear that the process was appropriate, it was the execution that was flawed. This are real consequences to real people. This matters. I hope that when people look at this they will look at it as a benefit for Canada, not for the benefit of a small area only. This would benefit all of Canada. I encourage all members of the House not to just look at their concerns and interests but to look at the big picture, look at it for the benefit of Canada. I’m so sorry, Ms Mcleod, but I find it impossible to fulfill your request to “look at the big picture, look at it for the benefit of Canada” when we should all be looking at a far bigger picture re the result of the oil and gas subsidies our government still hand out to that destructive industry. When the oil patch is still expanding despite the obvious need to “leave it in the ground” we have a much larger problem than simply the transport of this benighted material to other parts of this continent or world. That problem involves the survival of human society. Both Justin’s government and your previous Harper government are at fault for allowing the NEB to remain captured by the fossil industry and lead us into the 15-20 billion dollar boondoggle we taxpayers have now signed up for. The present government is trying to have their cake and eat it too when they promise one thing in Paris and on the campaign trail, then reverse all those promises and hitch their wagon to the prementioned industry. They’ve had their chance to cut fossil fuel subsidies, switch them over to the renewable energy forces able to develop many more clean jobs than a dying industry could ever produce, shut down that enormous hole in the ground called the tar sands that’s poisoning the lands and waters, and prove to the world that Canada is REALLY back! Not just in words, but in action. Until that happens I hold both those governments equally responsible for crimes against the future of our descendants. Climate change is here. It is human caused. As the increasing extreme weather events are telling us is that when we arm wrestle Mother nature we’ll lose big time. Don’t get bogged down on the problem of bitumen transport. Look far beyond that at a much BIGGER PICTURE! Well again she takes my respect away…why even say anything, this is not a subject she has any say or imput on? The pipeline does little or nothing for us here, hasn’t for years- there was a time it did. It will shoot through and give folks already working, more time. Would do the same without touching it. This is a fiasco by the liberals (I’m one). And I’m not anti pipeline, but there comes a time to give it up. (None of the parties are willing to do the work it would take to make the waters safe, they will all let morons sail in from other countries, the issues I have with the expansion are on the water, not the land) Sorry but Ms. Mcleod is still just spouting the party line, she seemed to get some independence for a bit. But it looks like harper put his foot down and now she moves back to backbencher status and mouthing whatever they tell her. Until the powers that be-whoever is “in”, address the shipping issues associated with moving oil through inland/coastal waters- that means small Warships for enforcement and Canadian pilots only to a 200 mile limit, outside of the island. This will never be done right….so stop pushing crap down people’s throats. This is just the cons pushing the greed manifesto again….had enough of that last time they were in. Dear Ms.Mcleod, try spending time helping locals instead of your party, your better at that. I find the statement “Canadians are polarized about oil and gas when we should be focused on how cleanly we can produce it, how safely we can transport it and how wisely we can consume it” interesting. If we’re focussed on how cleanly we produce oil and gas, then we should shut down oil production in the oil sands, arguably the “dirtiest oil” in the world. If we’re focussed on how wisely we consume oil, then perhaps we shouldn’t be building new pipelines or expanding existing ones which facilitate the greater consumption of fossil fuels. Not once in this column do the words “climate change” appear. Lastly, I agree that the Liberals have failed, but not in adhering to the process. They should have first remade the NEB as a truly independent body, and they should have revamped the assessment process, a process which the previous Harper gov’t had whittled down to a mockery of fairness. Thank you Mr McGuinness,This is the best reply I have seen.Your comments repudiate everything Mz Mc Leod has said and show the way forward. Excellent, very well said Cathy McLeod MP.